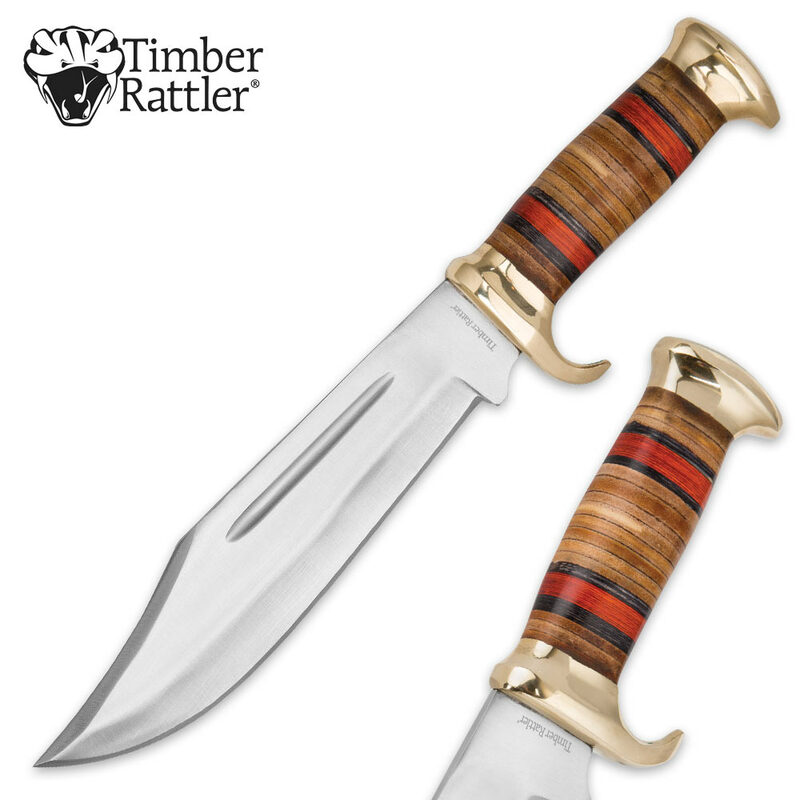 Timber Rattler Thunder Basin Bowie Knife with Leather Sheath | BUDK.com - Knives & Swords At The Lowest Prices! Timber Rattler’s Thunder Basin Bowie Knife is grand and robust - like the vast grasslands that carpet the West and the intense, hulking storm clouds that roll above them. Pick it up once, and you’ll know what we mean; it’s as if there’s a fierce energy pulsing through this big beast of a bowie that’s just waiting for you to let it loose. Fueling the beast is a stout 8” J420 stainless steel clip point blade. It has the muscle to conquer even the most demanding jobs - whether you’re out on the prairie, deep in the woods or in your suburban backyard. Despite its size, the “Thunder Basin” is a pleasure to wield, thanks to impeccable balance and weight distribution and a handle that feels like it was custom tailored to your own hand. Stacked rustic bands of leather encircle the sturdy handle, finished and polished to a high gloss that highlights the leather’s caramel, mocha, tawny and burnt umber hues. 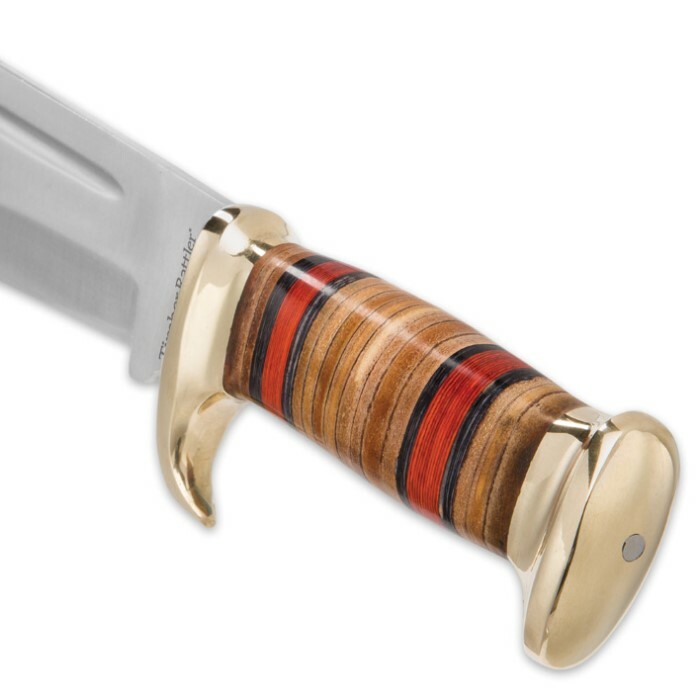 Two wide bands of scarlet and black offset the countless shades of brown, and the gleaming brass pommel and guard complete the rich array of colors. At 14 1/2” long overall, the Thunder Basin will chop, slice, hack and cleave its way through any task, and its superb hand feel reduces any fatigue you’ll experience as a result. Encased in the included genuine leather sheath, Timber Rattler’s Thunder Basin Bowie is an impressive ensemble, ideal for both display and field use. And you won’t believe the price! 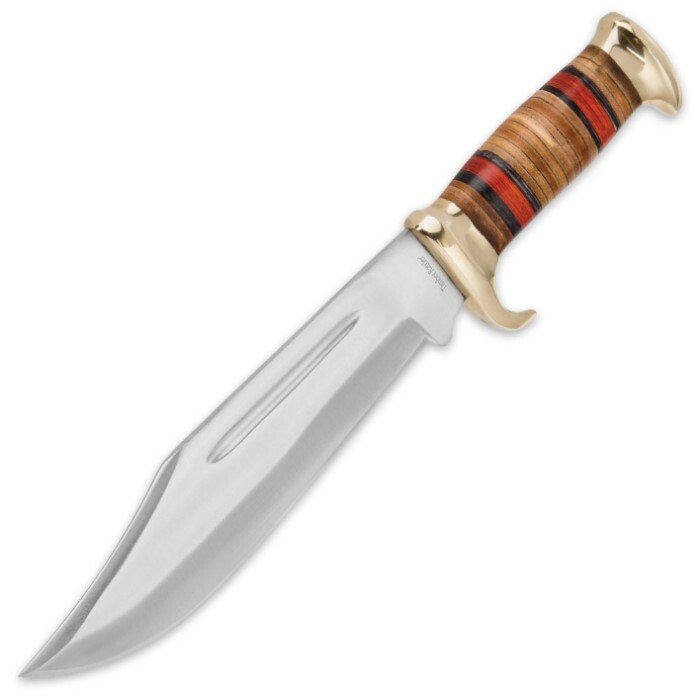 Rest assured you won’t find a more affordable bowie of this caliber anywhere else, so stop your searching and order today! Got a sample of this knife as one of my "scratch and dent " bowies and was wondering what I was until this was posted on the website. There were no markings on the knife, I guess because it is a sample . It is well made, the blade is pretty sharp, and I like the stacked leather handle. I actually thought the handle was wood until I read the description of the knife. Only flaw was a small grinding error near the hilt of the blade. Does not appear to be full tang, but feels solid. I haven't tried chopping anything yet. Another downside was that since the one I received was a sample, it did not come with a sheath, so I'll have to see if I can make one, or buy another one when it arrives so that I'll have a knife complete with sheath.